What Are the Different Types of Parakeet Supplies? Parakeets should be fed high quality seeds. A parakeet can be an enjoyable pet but, like all pets, requires care. 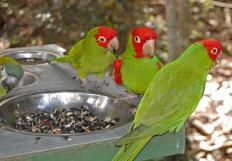 Parakeet supplies can be found at many pet stores and discount stores. A parakeet needs a cage, perches, toys and lots of attention. A well-balanced diet with proper supplementation is essential to the bird's good health. A nest also is important for a bird that is breeding or seems nervous. Parakeet supplies are easy to find. One of the most common places for bird owners to get supplies is a pet store. Many supplies also are available in online stores, which may have more variety. Basic supplies such as treats and seeds can be found in some grocery stores, discount stores and department stores. This bird does not need a very large cage, though it should be large enough to allow some flight. Larger cages are required if more than one parakeet is owned. A cage with a tray can make clean-up easier when it comes time to change liners. Cage liners can be purchased or made from newspaper. Mild cleansers are used to clean a parakeet cage and often can be found with other parakeet supplies; harsh chemical cleaners are toxic to parakeets and should be avoided. Perches can be made of plastic, wood or other materials. Parakeet ladders and swings also can be used as perches. Perches provide places for a parakeet to rest, in general, and a place to sit while eating or drinking. A variety of perches can help provide stimulation for a parakeet and keep it from being bored. Toys are necessary for a parakeet to be happy and healthy. A bored parakeet will often pull out its feathers, but parakeets are very intelligent and will get tired of playing with the same toys. Bird owners should have a variety of toys in their parakeet supplies and switch them out on a regular basis. Toys can be as simple as strings of plastic beads or toilet paper rolls. Bells, bird gyms, mirrors and plastic rings also are popular toys for parakeets. A variety of foods should be included in any bird owner's collection of parakeet supplies. 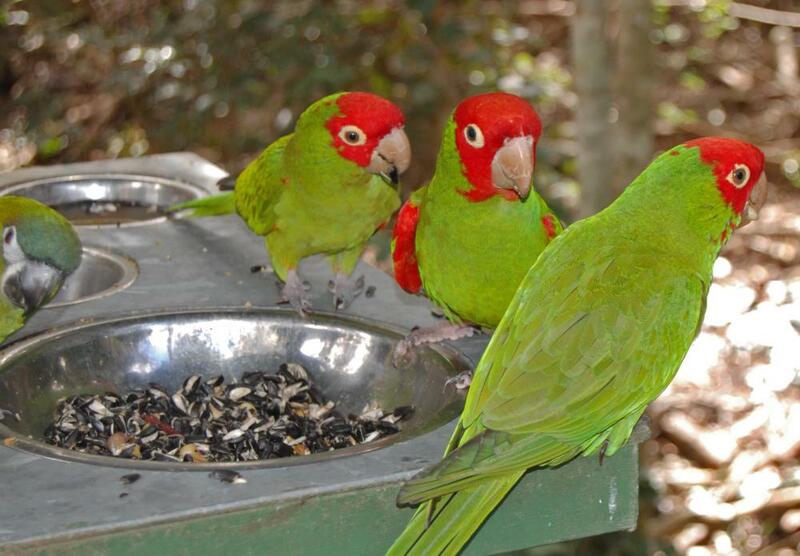 Parakeets need high-quality seeds and fresh foods such as bean sprouts and peanuts, but care should be taken when feeding fresh foods because some — such as avocados — are poisonous to a parakeet. Treats such as millet or sticks of berries and seeds can help provide valuable nutrients. Gravel, which aids in digestion, is essential to a healthy parakeet and should be offered daily with calcium-rich cuttlebones. Food should be offered in open containers that attach to the side of the cage. Fresh water is essential for a parakeet. Some bird owners offer shallow dishes of water while other owners prefer to use water bottles designed for birds. Parakeets enjoy baths and shallow dishes that attach to the side of the cage or sit on the cage bottom are often used for this. Nests also are often included on the list of necessary parakeet supplies. Nests can be boxes or specially made bird tents that fit easily into a cage. Nervous birds enjoy hiding in nests, an activity that helps them to relax. Breeding birds also require nests to feel secure. What Are the Different Types of Parrot Nest Boxes? How Do I Choose the Best Parrot Gym? What Are the Different Types of Parakeet Cages? What Is a Ring-Necked Parakeet? What Factors Affect a Parakeet's Lifespan? What Is a Turquoise Parakeet?